In 1965, I approached top fashion photographer John Cowan. J.C. already had an assistant at the time, but was impressed enough by my enthusiasm and print quality to offer me a casual position as darkroom technician and second assistant. I worked for Cowan most days, but also freelanced as an assistant to other photographers and studios. This work included photography for car brochures shot on location, and room set photography for mail order catalogues. This work involved large 10 x 8 and 5 x 4 format cameras, where the work had to be of the highest technical quality. This period contributed greatly to my overall photographic experience. 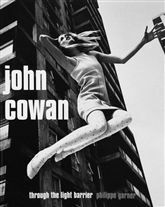 To learn more about this fascinating fashion period during the 60’s, you could purchase ‘Through The Light Barrier’, the story of John Cowan who sadly died from cancer in 1979 aged only 50. Many of the images were printed by myself and the book is available at my Camera Store in the books section. This is a quote from the jacket of the book…. Six feet four and described by Terence Donovan as a “Guildford version of the Marlboro man”, it seems entirely fitting that Cowan’s studio and images should have provided the location for Antonioni’s classic sixties film “Blow-Up”. Conversely Cowan himself seems to have been equally influenced by the cinema: using stylistic devices from the cult James Bond films of the time and for a period driving his own Aston Martin. Garner however, in producing a rounded biography of Cowan’s career, does his duty to the full in giving equal regard to the imperfections within his character. Fashion, a fickle bedfellow at the best of times, was sponsor, passport and nemesis for this tragic hero, although a cruel irony can be found in the fact that it was cancer, rather than his acts of daring do, that eventually put an end to this roman candle career. A fascinating and important book for all interested in the rise of the medium in this country and a worthy epitaph to a fine, much overlooked, photographer. I married Denise in 1975 and in order to pay the bills, gave up photography for a while. In my spare time, I took a course in electronics and established myself as an electronics repair technician. In 1987 we moved back to London with our two children, Adam and Emma. In 1988 I became the technical trouble-shooter for South Bank Studios, undertaking all repairs in house. The studios specialised in hiring space and equipment, including electronic flash, to car photographers and pop video production companies. In 1992 I left South Bank and began writing computer code for a pet project – horse racing analysis software, Speedmaster. The software won awards and by 1996, it became the market leader amongst horse race analysis programs. In 2004 I traded the rights of the program and assisted in establishing the software as an on line web product as opposed to a desktop download. Those 12 years of front line computer experience have helped me understand computers as an essential tool, not least in photography. Although now retired from the rat race, I am taking a fresh look at photography, using digital techniques. If you are a model looking for test shots for your portfolio, or you have a product you want photographed, don’t be afraid to ask. Just drop me a line. I’ll be delighted to get back to you.